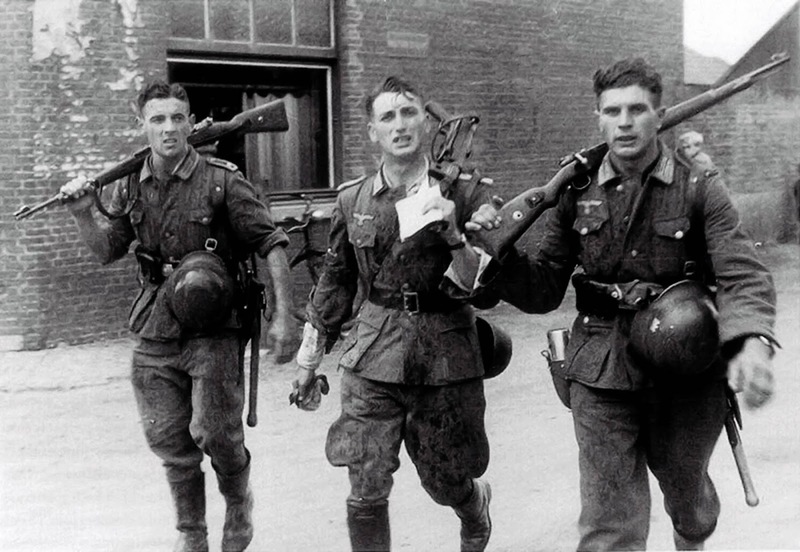 Three German soldiers returning from training exercise, France, October 1941. Every time this image gets posted on the internet a caption from the book “The K98k Rifle” gets attached to it which claims that these soldiers are fresh out of a firefight. However, the original Bundesarchiv caption reads: “Frankreich.- Erschöpfte Soldaten mit Gewehr K98 bei einer Übung / Marsch, Leutnant mit Maschinenpistole in der Mitte gehend; PK 695”. This clearly states it’s a training exercise in France. Furthermore, these men don’t look like they just got back from combat. Their uniforms aren’t soiled at all, they are carrying almost no gear (the officer doesn’t even seem to have a magazine pouch), the rifles have metal muzzle covers attached and they all have their helmets hooked onto their belts. If they were close to the front at all they wouldn’t look like this. They would be filthy, their guns would be ready to fire and they would be carrying more kit. The men to the side are armed with K98’s with walnut stocks and flat buttplates, while the officer is carrying an MP40 submachine gun on his shoulder. The Mauser Karabiner 98k rifle was widely used by all branches of the armed forces of Germany during World War II. It saw action in every theatre of war involving German forces, including occupied Europe, North Africa, the Soviet Union, Finland, and Norway. Although comparable to the weapons fielded by Germany’s enemies at the beginning of the War, its disadvantages in rate of fire became more apparent as American and Soviet armies began to field more semi-automatic weapons among their troops. Still, it continued to be the main infantry rifle of the Wehrmacht until the end of the War. In Wehrmacht service the MP-40 suffered from a number of shortcomings. The most significant of which was that its relatively high production cost meant that it was issued exclusively to paratroops and infantry squad leaders. However, later experience with Soviet tactics, such as the Battle of Stalingrad where entire Russian units armed with submachine guns outgunned their German counterparts in short-range urban combat, caused a shift in tactics, and by the end of the war the MP-40 and its derivatives were being issued to entire assault platoons on a limited basis. Perhaps not that recently, at least not the flanking soldiers. Their rifles have the muzzle covers attached - metal devices which hooked over the front sight, with a hinged cover to protect the muzzle while cleaning and when not in use. Very fiddly to fit and certainly not something you'd be using anywhere near a firefight. Their helmets being looped on the front of their belts also seems unlikely if they were in the vicinity of a tangle - you wouldn't be able to lie down. The soldier in the centre is carrying an MP38, note the hole in the magwell.